Review posted April 9, 2015. Albert Whitman & Company, Chicago, 2014. 36 pages. I love picture books. But now that my sons are adults, I don't often purchase a picture book for my own use. The ones I check out from the library are generally enough. So it tells you something about how much I love this picture book that I just ordered myself a personal copy. I'm going to give a Spoiler Alert for my review -- except I don't believe you can Spoil a picture book. It's not about what happens, but about how exquisitely it's carried out. I will tell you what happens -- please, check out this book yourself to appreciate the beauty of how it's done. For starters, it's set in Paris. The book opens to a typical gray cloudy day looking at the park below the Eiffel Tour, with many people and dogs strolling. Madame Martine is then pictured in her dark gray coat, carrying an umbrella and her shopping. Madame Martine lived alone in a little apartment in Paris. She took the same walk every day. She shopped at the same stores. She wore the same coat. That was how she liked it. Madame Martine lived near the Eiffel Tower, but she had never climbed it. "Eh. It's a tourist thing," said Madame Martine. We hear about Madame Martine's routine, with specific foods for each day of the week. We see tourists ask about the Eiffel Tower and hear Madame Martine's disdain expressed. 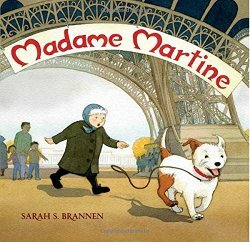 But one rainy Saturday, Madame Martine finds a "very small, very wet, very dirty dog," a dog who needs her. She starts doing her routine with her little dog Max along. But one ordinary Saturday, Max suddenly chases a squirrel -- and ends up climbing the Eiffel Tower! In fact, Madame Martine doesn't catch him until just before the doors close on the elevator up to the top. "Oh!" said Madame Martine. "I never knew how beautiful it was." "How did you bring that dog up here?" asked a guard. "Dogs are strictly forbidden." "I didn't bring him up here," said Madame Martine. "He brought me." The remaining few pages of the book are bright and sunny. Madame Martine is now wearing a bright red coat, with a yellow patterned scarf. Madame Martine and Max still have a routine. They still buy certain foods on each day of the week. Every Saturday they tried something new.